Supermarket sales rose at their fastest rate since September 2013, driven by food shopping at Easter and higher inflation, according to industry data. Market researcher Kantar Worldpanel found Britain's grocery market grew by 3.7% in the 12 weeks to 23 April. The results were boosted by a late start to the Easter holiday this year. Shoppers spent £325m on Easter eggs alone, increasing the average price they paid for an egg by 8.6% to £1.65, Kantar said. They also bought 20 million packets of hot cross buns in one week. Tesco returned to growth, with sales up 1.9% to £7.26bn over the quarter, although its market share fell to 27.5% from 28%. Sainsbury's sales rose 1.7% to £4.25bn, the biggest increase since June 2014, although its market share fell to 16.1% from 16.5%. On Wednesday, the retailer posted an 8.2% fall in profits and warned about rising costs. Despite these positive quarterly sales figures, the supermarket has warned of "challenging" trading and ongoing price pressures, posting an 8.2% fall in annual profits. Asda saw its market share fall to 15.6% from 16%, even though sales rose 0.8% to £4.1bn, its first year-on-year sales increase since October 2014. Out of the big four, Morrisons was the fastest growing supermarket, helped by its The Best line attracting more affluent shoppers. Sales went up 2.2% to £2.76bn although its market share fell 0.2% to 10.4%. Waitrose's market share was unchanged at 5.2% while sales climbed 3.1% to £1.36bn. Iceland, Aldi and Lidl all saw sales rise by 9.3%, 18.3% and 17.8%, with Aldi and Lidl achieving new record high market shares of 6.9% and 5% respectively. Fraser McKevitt, head of retail and consumer insight at Kantar Worldpanel, said: "All 10 major retailers are in growth for the first time in three-and-a-half years, when we last saw like-for-like grocery inflation as high as it is now. "While prices do look set to rise further, the current inflation rate of 2.6% is still below the average level experienced by shoppers between 2010 and 2014." 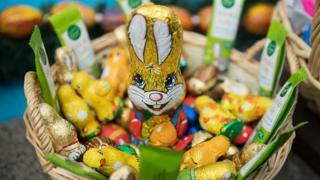 Separate figures from Nielsen also show supermarkets enjoyed their best sales this year, even without the effect of a late Easter. Mike Watkins, Nielsen's UK head of retailer and business insight, said: "As long as real incomes don't come under too much pressure and employment remains high, shoppers will begin to adapt to moderately rising grocery prices, albeit this could be by modifying how much they spend in other retail channels."